Wow, what a comfortable jacket! 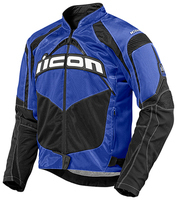 The Icon Contra jacket uses quite a variety of materials which add up to some sharp styling and a jacket that should be very comfortable to wear and ride in. While technically this jacket is listed as a textile jacket, it is actually a bit of a mesh hybrid. The belly, shoulders, lower sleeves, and sides of the back are all actually a mesh material. The rest of the jacket is a very sturdy feeling nylon material with extra reinforcement in key impact areas. On top of that, the sides and underarms are made from a very soft, stretchy fabric which seems to breathe well and definitely adds to the comfort factor. Speaking of stretchy, there are also stretch panels at the elbows, shoulders, and upper back. There are some ratchet type waist adjustment straps which seem to work well – these help keep unwanted air from entering the bottom of the jacket and also keep the jacket from riding up. The Icon logo on the front of the jacket is a molded rubber piece, and there are large rubber pieces on the upper arms and upper back as well. While these look pretty cool, I wonder if they would catch on the pavement in a crash. Other than that though, protection in this jacket seems to be quite good. The chassis of the jacket is made from a thick, sturdy feeling ballistic nylon. There is CE approved armor for the elbows and shoulders, and a dual density foam back pad. The back pad can also be upgraded to the Stryker CE Back Protector (see below). The Contra would be well suited to cool to hot climates. There is a fully sleeved insulated liner which will help keep you warm, but remember that a good portion of the jacket is mesh – so colder temperatures are going to get through to you. In the summer I think this jacket would work quite well – and it seems beefier than the usual mesh jackets that are out there. Be sure to check out the larger pictures of the Contra by clicking the link above.